Director of the General Department of Politics of the Vietnam People’s Army Luong Cuong met Chief of the Naval Staff of the Indian Navy Admiral Sunil Dhanoa, and received Air Chief Marshal Birender Singh Dhanoa and Army Chief General Bipin Rawat in New Delhi, on November 14. Speaking at the meetings, Cuong affirmed that the Vietnamese Party, State, People’s Army and people always bear in mind the support of India for the country’s struggle for national liberation in the past and for its current nation building cause. 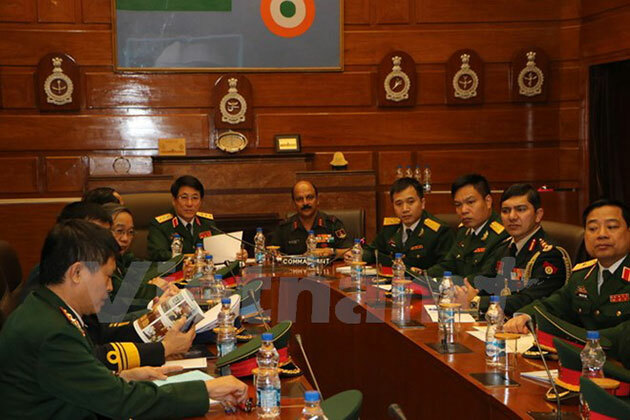 He said the regular exchange of high-level army delegations has proved effective, suggesting the Indian Armed Forces’ units, especially the Navy, Air Force and Army, intensify cooperation with the Vietnam People’s Army (VPA), with the focus on personnel training, exchanges of young officers, and coordination in United Nations peacekeeping missions. Indian commanders vowed to exert efforts to strengthen ties between the two armies, particularly in defence collaboration. India is willing to help the VPA in several fields that it has the expertise, they confirmed, showing their determination to implement signed defence agreements and recommending possible cooperation domains. Early, Cuong and the Vietnamese delegation visited the National Defence Academy./.